If you have been involved in an accident which has deployed your Airbags or seatbelts, or you have simply hit a speed bump / pot-hole a little too fast, or maybe you have done nothing more than jump start a discharged battery on your car, then you may have been left with an Airbag warning light that is now either illuminated or flashing on the dashboard. Some vehicles have even been known to shut off the fuel supply and to then activate the interior and hazard lights when this happens. If you have found yourself in this situation, then it is highly likely that your Airbag control ECU has now recorded some crash data, (and possibly some other error data as well). As of March 20th 2013, if the Airbag light is continuously illuminated, then this will now be deemed as an M.O.T. failure. If you have then tried to clear this using a diagnostic tool you may well have come up with the messages of CRASH DATA STORED, ECU ERROR or DTC 65535 in the Airbag computer, and you may find that you cannot clear it, as once the Airbag module has locked, neither normal diagnostic nor Main Dealer equipment is be able to clear this. Until now, your only option will have been to replace the very expensive Airbag ECU, often costing several hundred pounds. 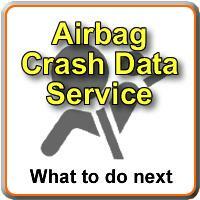 We can now clear all of the the recorded crash data and reset your Airbag module, but you will need to send the Airbag ECU to our workshop for this work to be carried out. Approx turnaround time is 48 hours from receipt to dispatch. 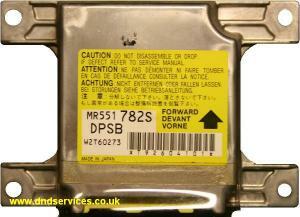 All you need to do is remove your original airbag module and send it to us. The location of this can vary but generally the Airbag ECU is bolted to the floor under the centre console or centre dash area. Once located and prior to removal, it is important to observe any SRS precautions as described in your service manual, and you must disconnect the battery negative before removing the unit. Once the ECU has been removed you should be fine to start your car providing it will run without the module, and don't worry about upsetting other systems, as the vehicle should recognise it once it has been reset and it's all back together again. This service only covers the Airbag ECU as shown, but as we now support most other makes and models of Airbag Modules, we would ask you to contact us for more information if you are unable to find your particular vehicle listed on our website. We accept no responsibility or liability whatsoever for this service, nor from any situations that may arise as a result of the removal and refitting of any part of the Vehicle Supplementary Restraint System.